The temple is located in Nevsky Prospect not far from the Griboyedov Canal. 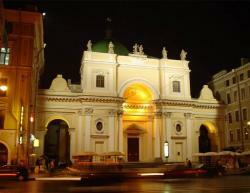 It is one of the oldest and largest Catholic churches in St Petersburg. The first wooden Catholic church was erected soon after the foundation of St Petersburg. It was situated not far away from the Summer Garden. Then in 1720 the church was rebuilt in stone. On the 14th of September 1738 the Empress Anna Io­annovna signed the Ukase. According to this Ukase the Catholic Community recieved a plot in Nevsky Prospect for construction of the church. The project of this church was made by the architect Pietro Trezzini. The construction wasn’t started for a long time. In 1759 the building was commissioned to the French architect Jean-Baptiste Vallin de la Mothe. Val- lin de la Mothe changed a lot the project of the church made by Trezzini. The church was laid on the 16th of July 1763. In honour of this event the silver medal was minted. On this medal the Empress Catherine II was depicted. The architect designed the main faсade as a triumphal arch resting on elegant columns. But Vallin de la Mothe left Russia in 1775. The construction was finished by An­tonio Rinaldi. The consecration of the church took place in October 1783. St Catherine Roman-Catholic Church is a complex building on a cruciform base. The length of the church is 44 metres, it’s 25 metres wide and 42 metres high. The church can accommodate up to about 2 thousand praying persons. It’s crowned with a large dome on an impressive drum. The building is spacious and bright. Between 1828 and 1830 the walls and the Corinthian columns support­ing the vaults were faced with artificial marble. The interior of the church struck by its magnificence. The hall of the church was decorated with many wooden sculptures and splendid icons. The altar was sanctified in honour of St Catherine of Alexandria. The wonderful artistic effect of the interior was created by the fine paint­ings, stained glass windows, the combination of compli­cated pilons and sculptures. The rich marble communion table decorated the central nave. Inside the church the last Polish King, Stanislav Augusteus Poniatowski was bur­ied. The pride of the temple was an excellent organ. That organ was made to a special order by German masters. Today nothing of the splendour is left. In September 1938 the church was closed and ravaged. All the icons were destroyed. The fine library of the church was burnt. There were about 60 thousand rare books in 30 languages. One of the parishioners saved a large altar cross. She took it out from the garbage. Later this cross was returned to the church. First the building of the church was given to the Mu­seum of Ethnology. After the Great Patriotic War it was decided to open a concert hall here, but on the 14th of February 1984 there was a fire. In the 1990s the restora­tion of the church was started. In October 1992 St Catherine Roman-Catholic Church was consecrated and the first service was held.